How about a 14-day trip through Iceland? I just found a great deal for you. Flights and rental car are included in the price of only 1327 DKK for a trip with 4 persons. The price is only possible through a seperate booking of flights and rental car. For a trip with 2 persons you’ll be only paying 1913 DKK. Just lean back in your car and explore the biggest volcanic island on earth. 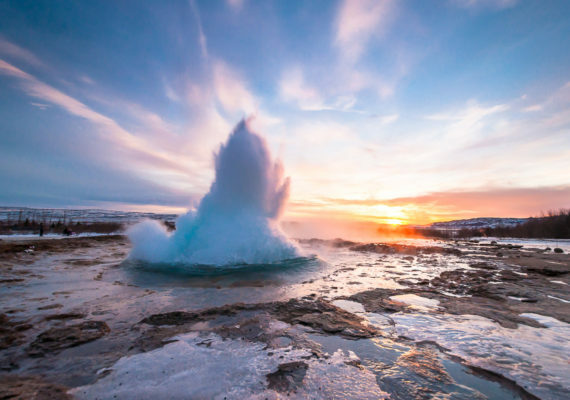 There are lots of great spots to visit during your trip just like the beautiful nature with its volcanos and the hot springs or the capital Reykjavik. As soon as you arrive at the airport you can pick up your rental car and start the amazing tour. Your flights are with WOW air from Copenhagen to Reykjavik. One small piece of hand luggage is included in the price. You can add checked luggage to your booking at an additional cost. There are dates available from April – June, like I’ve listed below. Go ahead and try it out with your preferred travel dates. You can find hotels for your stay on Trivago. Watch out: When you click on the following flight links, the total price for 4 persons will be displayed. Let’s go to the Iceland deal! Sign up for our Newsletter, and don’t miss anymore deals. You’ll be the first to find out about our Iceland bargains!